Black Note has an impressive range of naturally-extracted tobacco e-liquids, shooting for an authenticity unheard of in tobacco flavors. 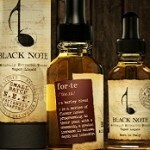 The Italian, music-inspired names give off an impression of class, even before you get into the fanciful flavor descriptions and elegant presentation, but can Black Note really do enough to bring vapers away from the fruity and sweet e-liquid flavors that dominate most juice collections? With eight tobacco e-liquids on offer, the brand aims to bring high-end tobacco flavors to the world of e-liquid, and the results are pretty impressive (head over to our full Black Note review for more on the mixer). Sonata is their attempt at a Cavendish, using the characteristic sweetness-boosting process on a dark Virginia tobacco, but does it translate to a pleasant vape? Sonata is described as rich and robust, with an authentic, natural sweetness to top it all off. The e-liquid has an immediately dark flavor, with complex tobacco notes hitting you on the inhale, underpinned by a subtle nuttiness and soon accompanied by a pleasing sweetness as you continue your draw. The more overt tobacco element of the flavor is quite understated, with the sweetness and nuttiness taking center-stage, turning the otherwise complex and acquired taste of a dark tobacco into something much smoother and warmer. Rich and robust is right, but this isn’t the sort of powerful taste that will evoke memories of combusted tobacco, unless you happened to smoke tobaccos fit for a king. Sonata is truly delicious, and that’s especially high praise for a tobacco e-liquid. While the authentic, smoky and slightly nutty aroma of the tobacco is there, the dominant, clean and natural sweetness riding on top of the cascade of vapor is what really takes this to the next level. It’s the sort of e-liquid that keeps you wanting more, leaving you with a pleasantly sweet and nutty taste playing on your tastebuds that you just want to top up with another puff. It might not be what you’re expecting from a tobacco e-liquid, but given the quality of the resulting flavor, that’s hardly a criticism. Use one of our Black Note coupons to save on your order. See also: Premium e-juice brands of the year!